The album cover for “Blurryface”. Photo courtesy of Google Images. Blurryface by Twenty One Pilots (often stylized as twenty one pilots) is an evocative, experimental album unlike any other. This band combines deep and thoughtful lyrics, amazing beats, and influences from a wide spectrum of genres. Twenty One Pilots only features two members, Tyler Joseph (vocals, keyboards, synthesizers) and Josh Dun (drums and percussion). The band’s first full-length album, Vessel, which came out in 2013, is still my personal favorite, with some extremely impressive lyrics, melodies, and rapping. 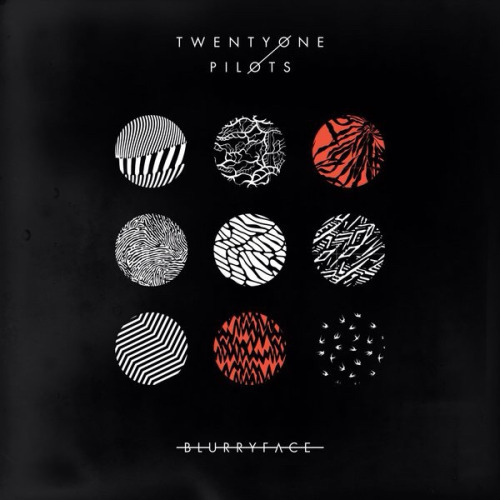 Blurryface, however, really does kick it up a notch, or possibly multiple notches. Twenty One Pilots’ lyrics always have a way of finding themselves into the depths of a person’s soul, but this album’s incredible lyrics are accompanied by really powerful bass that, especially with a quality sound system or good pair of headphones, truly take that feeling to next level. You will literally and figuratively feel this album in your entire body. This album, on both emotional and intellectual levels, truly hits home and captures the reality of being a complex human being in a complex world. Placing “Ride” as the next track was a genius move, considering that it has an amazing message about how to just enjoy life and stop worrying about stress. The reggae influences in this song also give it a particularly freeing feeling. This is mixed with some classic alternative music methods of catharsis, such as Joseph’s incredible scream towards the end, which symbolizes letting go of all the tension felt previously. In addition to working through and letting go of stress, this album is about doing the same with insecurities. The title, Blurryface, refers to a character Joseph created, named Blurry Face, who represents insecurities Joseph—and all human beings—feel. Tyler explained in an interview earlier this year that feeling insecure is like suffocating, which creates a blurry feeling. Insecurity can cause self-doubt, lack of self-assurance, and identity conflict. If you watch the music video for “Tear in My Heart,” Joseph’s hands and neck are covered in black, greasy-looking makeup. As Joseph explained in the interview, the makeup represents his own personal insecurities about his own art—music, in this case. Twenty One Pilots have instilled so much deep meaning into this album, and there is always room for more layers of interpretation. This is what makes Blurryface a triumphant work of art, one that can appeal to a wider audience.